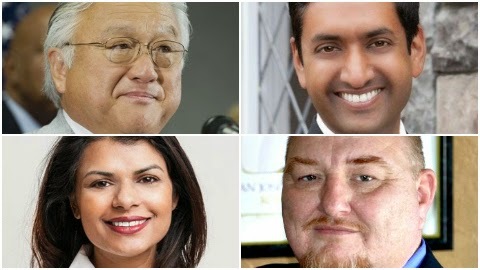 THE CANDIDATES Ask around you will likely hear one of two things when talking about Rep. Mike Honda: he’s a “nice guy” or “he hasn’t done anything wrong to deserve such a challenge to his seat.” A former teacher, Honda has long focused on education and his progressive voting record is one of the best in Congress. Annual rankings from the National Journal found Honda in an eight-way tie as the most liberal member of Congress last year. However, his far left stances have not been an issue during this primary campaign. Honda was first elected to Congress in 2001, but never has he faced a primary challenger more organized or fully-funded like his opponent this year…Ro Khanna was appointed to the U.S. Department of Commerce by President Obama, wrote a book on attracting and keeping manufacturing in American, flirted with running two years ago against Pete Stark and, in the meantime, amassed one the largest campaign war chest ever in the East Bay. Khanna’s focus on the district’s powerful tech industry is reflected in much of his campaign fundraising. Through mid-May, Khanna raised over $3.8 million and spent about one-third of his stash one month before Election Day…Vanila Singh is a medical doctor from Stanford who never appeared on the local political radar before jumping in the race last December. What she lacks in experience is more than made up with intangibles such as being a Republican female candidate who also happens to be Indian American (a fast-rising segment of the district’s composition.) Indeed, she may be the face of the new state GOP that has often looked old, white and out-of-touch…Joel Vanlandingham is a tech executive running as the “real” Republican in the race. The Alameda County Republican Party, though, has shunned him in favor of Singh. MAIN BEEF There appeared to be no perceptible uprising among voters in the 17th District calling for Honda’s ouster, in contrast to the situation two years ago with Pete Stark. Khanna, however brings youth and an extensive resume to the race. The main argument being made by Khanna is Silicon Valley deserves its rightful place at the top of the heap in Washington and Honda isn’t doing it. Khanna says Honda is not extending the district’s influence to Congress, while Honda refutes that he has been lax, citing federal funding he helped steer to San Jose for BART’s further expansion to the South Bay…Singh, however, believes there is another argument to be made against Khanna. She has consistently raised questions whether Khanna’s campaign recruited Vanlandingham and another Republican Vinesh Rathore Singh to confuse and dilute the pool of conservatives. Vanlandingham disputes this claim and says the Republican Party essentially “went shopping” for Vanila Singh, citing the fact she only registered with the GOP last December. The other Singh was throw off the ballot by a Sacramento Superior Court judge for lack of acceptable signatures on his nominating petition. QUOTABLE “The fact remains I’ve done something. That created hard jobs for everybody, from blue collar workers to white collar workers and engineers to professionals. That is what people want, they want results and that’s what I’ve done. It’s not theory.” said Honda, May 3, in response to Khanna asserting congressional earmarks no longer exist. Campaign Finance: Cash on hand through May 14: Honda $1,038,360; Khanna $1, 009,673; Singh $211,799; Vanlandingham, no report filed. ON TO NOVEMBER Honda vs Khanna will continue to be a national political story. Will a long-time progressive in the Bay Area be dethroned by a fellow Democrat for the second straight election cycle? If Honda fails to garner at least 50 percent of the June vote, alarms will be raised, but his victory in the primary is not disputed by many. The better barometer is how close a second is Khanna. If he is as close as Eric Swalwell was two years ago, the echo chamber predicting Honda’s demise will be deafening. Conversely, a spread of more than 10 points may only slow down Khanna’s momentum. In addition, it remains to be seen whether the accusations against Khanna manipulating the composition of the primary ballot has legs later in the fall. 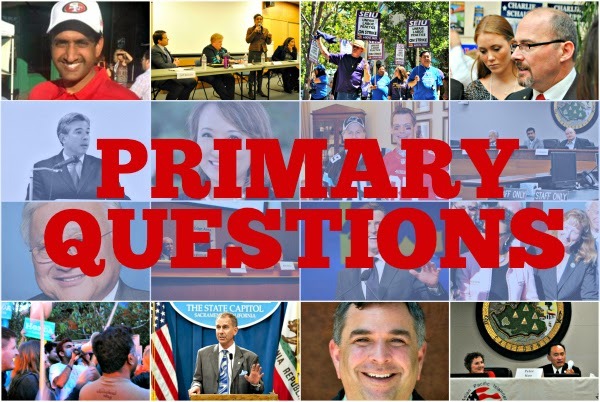 Posted in CA17, congress, Democrats, Joel VanLandingham, June primary, Mike Honda, Pete Stark, primary questions, Ro Khanna, Vanila Singh. Bookmark the permalink.